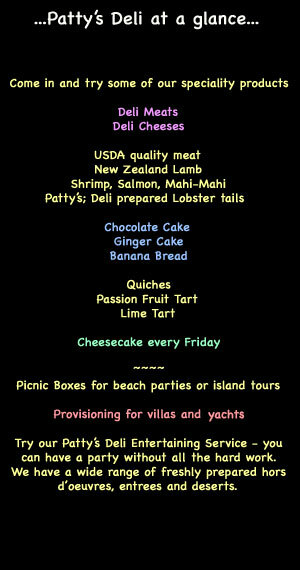 Patty's Deli is a gourmet food shop and delicatessan, conveniently located on Main Street in Hillsborough, the main town in Carriacou. We are minutes away from the jetty. We have an extensive deli counter with pre-cooked meats, salami and cheeses. Our chiller cabinet is full of yoghurts, fresh milk, belgian chocolate, fresh juices and cheese such as goats cheese, fresh mozarella, and our speciality blue cheese. In our freezer you will find USDA high quality meats such as boneless skinless chicken breast, frenched rack of lamb, leg of lamb, sirloin steak, rib-eye steak, pork tenderloin and pork loin chops. There is also a wide range of fish and seafood such as shrimp, seafood mix, salmon fillets, Mahi-mahi steaks and our home-smoked lobster tails (when in season). 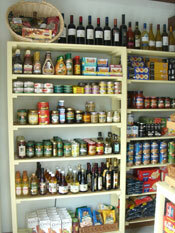 We have excellent selection of international wine and stock grocery products and antipasti from all over the world. Please come and visit us and be surprised at what you can find on Carriacou.